Mia Wright is Co-Pastor and Director of Ministry at The Fountain of Praise in Houston, Texas, with her husband Pastor Remus Wright. As partners in ministry and church leadership, Remus and Mia have built a 20,000+ member congregation, which grew from 100 members in 1991. Mia is a powerful inspirational speaker, who encourages others with uplifting messages, relevant life stories and life skills that apply in both the faith based and industry sectors. She is also a sought after national motivational speaker, women’s conference presenter, and corporate work / faith / life balance coach. As a speaker, Mia has shared transformational messages in churches, town halls, convention centers, hotels, corporate venues, schools, mud huts, and prisons around the world. 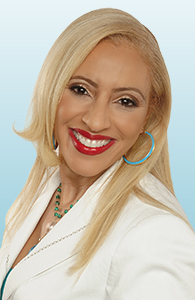 In addition to her speaking platforms and The Fountain of Praise Executive Leadership, Mia leads Metamorphosis Conference, Inc.
Mia K. Wright is inspiring people around the globe to pursue their passion for living. Through Metamorphosis Inc., an organization that encompasses the life changing Metamorphosis Women’s Conference based in Houston, Meta2 Girls - a mentoring program for teenagers, the Meta Compassion Outreach, Metamorphosis Empowerment Seminars and Metamorphosis International Programs, Mia is helping people to positively change their lives. She does so with a unique blend of ministry, personal enrichment seminars and life skill workshops. Simply put, Mia’s gift is in helping others to transform life’s broken places to a place of fulfillment and purpose. Through her work, thousands of women have embraced life long transformations. Mia is a noted community influencer and “woman to watch” in Texas. She is a visible presence on Christian television. She is a regular host on Houston’s “Joy in Our Town” and “Praise the Lord” on TBN – the Trinity Broadcast Network. Mia has also been a guest on the Daystar TV Network’s “Joni Show” and on “Celebration” with Marcus & Joni Lamb. In 2008, Mia was nominated as “Most Inspirational Person” by StreamingFaith.com the world’s largest online faith-based broadcasting portal. As a partner in the The New Directions Center, Mia conducts a mentoring program to help women develop their leadership potential and skills. Mia earned her Bachelor’s degree at The University of Texas at Austin. Following college, she embarked on a career in the pharmaceuticals industry where she was highly successful as both a sales professional and training specialist with Astra Merck (now Astra Zeneca). In 2005, Mia graduated with honors with a Master of Divinity degree from Southwestern Baptist Theological Seminary. She is a member of Alpha Kappa Alpha Sorority, Inc. Beyond her impressive academic background and professional accomplishments the greatest achievement of her life are her three sons, and her more than two decade marriage to Pastor Remus Wright.